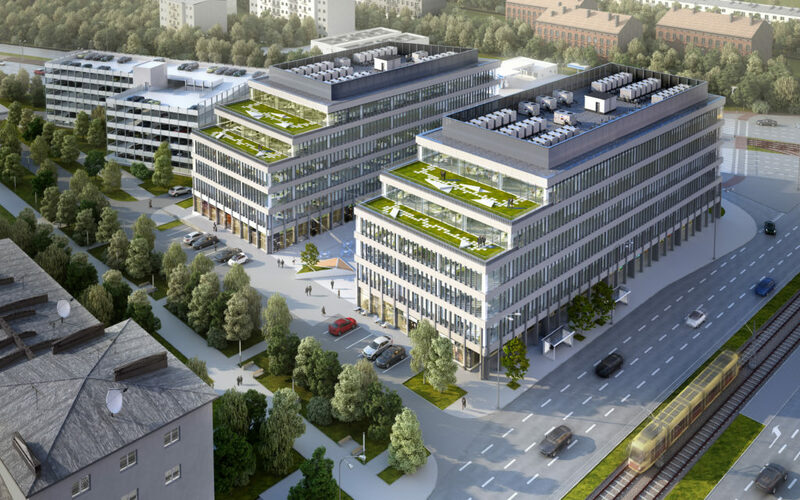 Avestus Real Estate has obtained a fully valid building permit for its office complex Imagine in Łódź. The modern office investment, located on the corner of Piłsudskiego and Śmigłego-Rydza streets, will offer 14,500 sqm of office space, 2,300 sqm of space dedicated to retail and services. The project will also offer 356 parking spaces in a dedicated garage. Construction works are to begin in November. Imagine is the first project developed by Avestus Real Estate in Łódź. A modern A-class office complex will consist of three buildings – two of them (six-floor buildings) give a total of 16,800 sqm of commercial space. The third building, the most distant from Piłsudskiego Street, is a car park with 356 parking spaces and 49 double bicycle racks. The project will offer state-of-the-art technological solutions e.g. : BMS System (Building Management System), which monitors and controls the operation of installations inside the buildings and a full heating, ventilation and air-conditioning system (4-pipe HVAC). Imagine will be completed in line with the requirements of A BREEAM Excellent certificate. “We are convinced that the project developed on the crossing of Piłsudskiego and Śmigłego-Rydza streets, will attract tenants’, and they will appreciate the innovation of the buildings, the highest quality of finishings and the use of modern energy-saving solutions. A great advantage of our office complex is also its location in the Special Economic Zone. Thanks to excellent access to a diverse communication infrastructure, Imagine responses to needs of companies looking for elegant and state-of-the-art offices with functional space, and in the perfect location,” said Mariusz Frąckiewicz, Director Poland at Avestus Real Estate. Imagine’s architectural project was designed by the DDJM Biuro Architektoniczne. An exclusive leasing agent is Colliers International. Construction works began in November, and completion date of the project is scheduled between late 2018 and early 2019.